With Forge World's recent release of some very nice looking Space Marine vehicle crew members, I decided to look back at what I've done when it comes to modeling these guys on my vehicles. I'm actually pretty lazy when it comes to doing this on my own vehicles, preferring to just get it done. Seeing Forge World's models makes me stop and think about what I do in the future. If you're a Space Marine player, I'm sure you have a ton of those half torsos you get in every vehicle kit just like I do. They just fill up your bits box and they're very rarely used. To be honest though, when it comes to taking on this kind of small "conversion," it's not like you need to go out and buy the FW ones... you could most likely convert your own with the bits you already have. Now I have gone the extra mile and added crew members on vehicles I've done for other folks. For the most part, I add the crew model that comes in the kit. But even just doing that helps. In the end, it's more than tossing a closed hatch up there. I think one of the biggest things is that adding this kind of detail brings a little more life to the vehicle. In some cases, it adds a different color as well to help make the model pop overall. 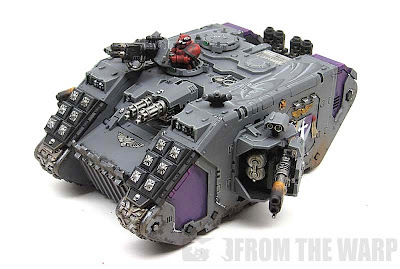 This kind of thing combined with maybe a touch of weathering and maybe even some minor freehand can take a bland looking vehicle and make it look top notch. 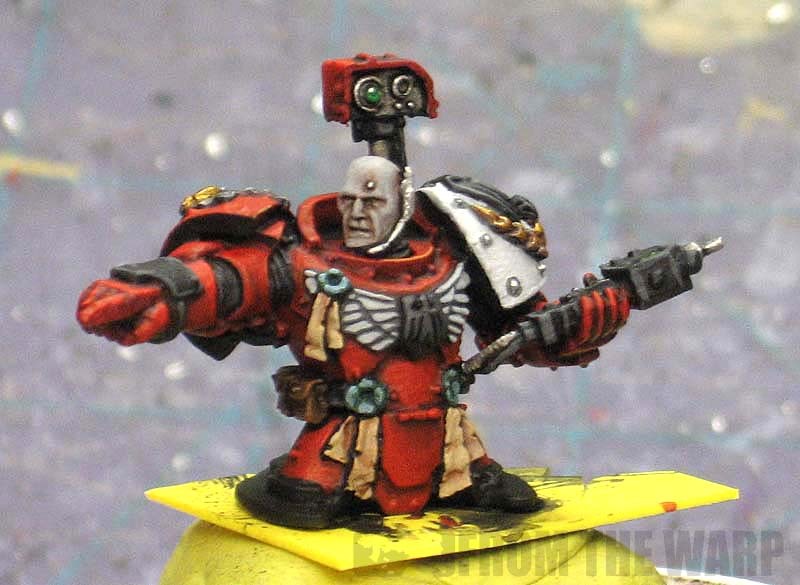 The only "conversion" I've done when it comes to this kind of thing was a Sergeant Chronus model I converted into a Raven Guard model by way of the iconography. Still, this kind of attention to a model that simply sits on top of a vehicle adds a something more to an army overall. I know I'm going to make the effort to add some crew members to my Land Raiders when finally get around to building them. It might be that extra touch that brings the vehicles and army alive. I probably won't be getting the FW models though. They're nice models, but I've got plenty of bits I can put together to come up with a Land Raider driver and gunner. Heck, I could even model them on foot too in case my vehicle gets blown up as it's prone to doing. Interesting article, I wounder how many people this FW release has inspired to put crew on some of their vehicles? They really do finish the model of nicely, especially a unique converted one. I'm not a fan of vehicle crews, im not sure why but it seems "toyish" it takes away the believeability on GW models for some reason. Almost as if they "cheapen" the miniature. Maybe it is just the poses i dont like? Maybe the reason they seem less believable is because they painfully show how out of scale some of the vehicles are to the infantry models? 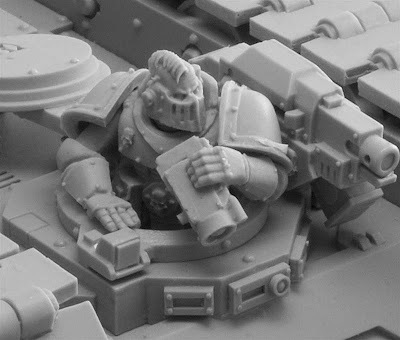 In particular the space marine tank commanders: How do those guys even fit through the hatch of their tank with those humongous shoulder pads? Pilot and crew figures do look nice and make the model more interesting visually, but with space marine vehicles they also subconsciously remind me of how silly that power armour really is. Look at the pilot of the Stormraven: how the heck is he supposed to be able to reach those buttons that are on the wall _behind_ him without smashing the entire cockpit with his huge pauldrons? IDICBeer: I figured if it's the first thing that came to mind for me, it had to have occurred to other folks as well. Fayte: That's a good point. It can be used as a way to differentiate between certain vehicles easily. Marsekay and Brothers Grimm: Interesting. Maybe it is a scale thing. Without the crew member visible, we see the vehicle and don't really compare it to anything else. With them on there, it can be odd in some cases? We try and figure out how it would work in real life. I think the trick might be going the extra step and giving the crew member as much attention as the vehicle gets to include weathering and such. I typically leave them off too for all of the scale reasons mentioned. It looks alright on a landraider but tossing a gunner in a rhino looks just strange. I've got to admit i love tank crew but then i love tech-marines so the 2 just go hand in hand for me, to be honest the fw crew models are very nice but i like the thought of converting my own with simple head swaps and such. I think if you try to go too fancy it looks a little too much and over done if you know what i mean. as with most things its down to taste,i use them as i feel it ties the model in with the rest of an army.we can all get lazy when building some sort of tank as sometimes it feels like it will never end.i use the addiction of a figure or two to detract my brain from all the weathering etc the tanks need. TheAmbit: I can see what you mean about the Rhino... it is a bit small isn't it? Ginger Kid: Maybe it's just a matter of using the FW models as inspiration for your own conversions. Marshal: That's a crazy amount of conversion work for one vehicle. That's the far extreme of adding things on. It looks amazing though. Anon: Good point, a model can help break up the weathering and huge blocks of color on larger tanks.